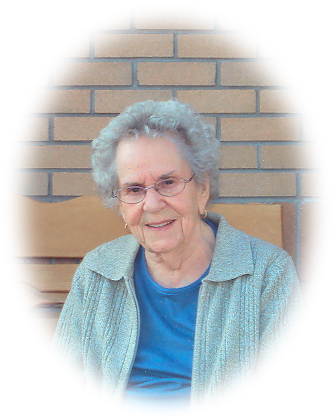 Gladys Greene Paradis, age 98 years, passed away peacefully at Pioneer Ridge on Tuesday, February 5, 2019. She was born and raised in Turtleford, Saskatchewan, the eldest child of Oscar and Lily Hanson. At the age of 17, she left home to work at a store in Livelong, Saskatchewan. During the war she moved to Ottawa to work for the Federal Government and it was there where she met and married CPL John Greene, of the Royal Canadian Air Force. They moved to Marathon in 1946 to work in the pulp mill, and there they raised three children. She was involved in community activities and a member of the CWL and the Legion Women’s Auxiliary. She worked for several years at the Marathon Credit Union. She greatly enjoyed her family and friends, camping, fishing and traveling. After the death of John in 1970, she remained in Marathon for several years. In 1975 she moved to Thunder Bay, where she worked at the YMCA. She met her second husband Arthur Paradis and they were married in 1981. Gladys was predeceased by her husband John in 1970, her husband Art Paradis in 1998, her parents Oscar and Lily Hanson, her brothers Leonard, George and Harold and sister Irene Murphy, granddaughter Heather O’Toole, stepson Roland Paradis and stepson-in-law Bob Backen. She will be lovingly remembered by her daughters Marlene (Len) Rocco and Barbara (Mike) O’Toole and son Norman (Joyce) Greene. Also survived by grandchildren Paul (Silvana) Rocco, Karen (Tony) Bossio, David Rocco (Laura), Jim (Sandra) O’Toole, John (Kim) O’Toole, Christopher (Catherine) Greene, Amanda (Trevor) Bewick and step grandchildren David and Suzanne Paradis, Lance and Jessie Backen and Ryan Paxton. She had several great grandchildren and numerous nieces and nephews. Also survived by sisters Kathleen Alexander and Shirley Tanguay and step daughter Cindy Backen. Tracey and Perry Towle, sons Adam, Curtis (Brooke) and Scott, were also very special people in her life. The family would like to thank the staff of Pioneer Ridge, Plaza 4, for their excellent care and attention to our mother over the past 7 ½ years. Cremation has taken place and a celebration of life will be held at a later date with interment in the Marathon cemetery. Donations may be made to Helping Hands Auxiliary to Pioneer Ridge or charity of your choice. Gladys Paradis will be remembered in the Blake Funeral Chapel Memorial Grove. Annual dedication service Sunday, June 14, 2020.